What if the invasion of Iraq had not happened? And without the UK support, even Colin Powell’s lies to the UN about Iraq’s WMD would not have been enough. And Tony Blair was no reluctant liar but a willing player in the scheme to dupe the UN. 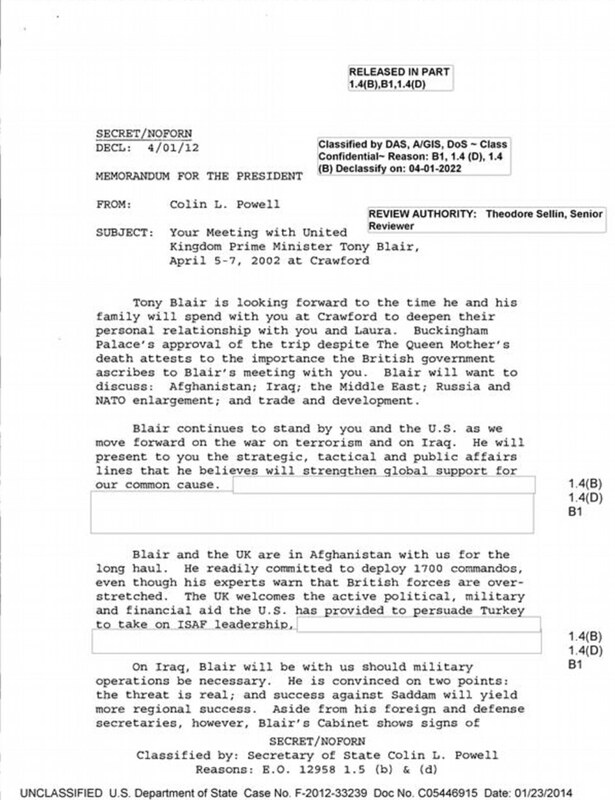 I wonder what history will make of Tony Blair now that this memo from Colin Powell has been revealed. A bombshell White House memo has revealed for the first time details of the ‘deal in blood’ forged by Tony Blair and George Bush over the Iraq War. The sensational leak shows that Blair had given an unqualified pledge to sign up to the conflict a year before the invasion started. It flies in the face of the Prime Minister’s public claims at the time that he was seeking a diplomatic solution to the crisis. He told voters: ‘We’re not proposing military action’ – in direct contrast to what the secret email now reveals. In it, Powell tells Bush that Blair ‘will be with us’ on military action. Powell assures the President: ‘The UK will follow our lead’. …. After 7 years as President, Barack Obama’s Iraq strategy is still ” not complete”. His Syria and Ukraine “strategies” are only conspicuous by their absence. Once upon a time and a fairy tale or three ago, I had very high expectations of President Obama. He had set the expectations himself with his rhetoric. There was nothing he couldn’t. But all that he will have accomplished by the end of his two terms is to have been the first “black” President of the United States – and he can’t even take credit for that. I have a theory that world development proceeds in steps and that these discrete steps are dependent upon the number of “leaders” available at any time in the world to work together. With “leaders” I mean those who take people along with them towards some vision of the world and are not mere “followers”. For the last 150 years the “leader” of the US has been, is, and must be a necessary – but insufficient – ingredient. The world stagnates or even moves backwards in the time when the political leaders are “followers”. A critical mass of “leadership” is not possible when the President of the US is a follower. It would seem that for the last 7 years we have had a “follower” in the White House whose actions are subordinated to his fears. It is paralysis by analysis which reigns. The closest to a leader in Europe has been Angela Merkel but even she has not communicated any vision of Europe – let alone the world – to chase. The clarity of a vision is important for leadership. A “consensus” vision is diffuse and muddled – almost by definition. My hypothesis is that real “leadership”, if existing simultaneously in 5 key countries/regions of the world, can provide the necessary and sufficient conditions to create new wonders. If the “leaders” of the US, Russia, Europe (whichever of France, Germany or the UK qualifies) together with China and India actually shared a vision of what could be done and “led” their people along that path, there would be a paradigm shift and a step-change to a level not ever seen before. BBC: The US does not yet have a “complete strategy” for helping Iraq regain territory from Islamic State (IS), President Barack Obama has said. Business Insider: “When a finalized plan is presented to me by the Pentagon, then I will share it with the American people,” Obama said. “We don’t yet have a complete strategy because it requires commitments on the part of the Iraqis as well.” ………. Obama said in September that the goal was to “degrade, and ultimately destroy, ISIL,” but that goal still seems far off. The development of proportional representation in democracies is a natural inhibitor of “leaders” and “leadership”. The focus on consensus politics means that, very often, it is the “lowest common” standards and goals that apply. This turns even very good leaders into mediocre followers. The coming together of a critical mass of “political leadership” in the world cannot be predicted. But it will surely happen some time. It might even happen in my lifetime, but looking at the field of Presidential candidates in the US, the next President of the US is likely to be another follower, and it will not happen anytime soon. Mercenaries have been called the second oldest profession in the world. Some claim that they are just a special sub-set of the oldest profession since they sell their bodies and their skills. But the idea that mercenaries are only those fighting under a foreign flag has never really made sense to me. Any volunteer army is essentially a mercenary army using my definition of a mercenary being any one who sells military services. Mercenaries were in common use by the time of the Romans 2,000 years ago. They were used by Hannibal and even by Alexander. They were in use in the Egypt of 5,000 years ago. We know little of the times earlier than the first civilizations some 6,000 years ago. But it is likely that some form of paid military specialists derived from those individuals who had specialised as hunters. They were probably in use from the time that human societies created the first settlements and where individuals had started specialising. That probably takes us back to times before the first cities and perhaps even to the time of semi-permanent, seasonal settlements (earlier than 12,000 years ago). Hunters became guards and then in due course became specialised soldiers. From the Auxiliaries of the Romans or the Seljuks a thousand years later, mercenaries have always been around. Gallowglasses and the Irish Wild Geese operated – for pay – all over Europe. The Viking traditions lived on with the Varangians who operated around the Black Sea. The business of soldiering was very lucrative – especially for the survivors. Criminal piracy was converted to the legal and profitable trade of privateering. Europe was filled with military entrepreneurs with mercenary regiments available to the highest bidder. Even the national armies and navies of various countries were available for hire. The Swedish Foreign Legion consisted mainly of Poles, The Turks employed Swedish elite troops and the Swiss Guard took care of the Popes. The Dutch had their Foreign Legion, the British had the Gurkhas and the French had their Foreign Legion in Africa. American pilots flew in the Lafayette Escadrille and American volunteers joined the Abraham Lincoln Brigade. Chennault’s Flying Tigers were American pilots flying in the Chinese Air Force. The Spanish had their Foreign Legion and the International Brigade fought in Spain. In the last 50-60 years, the business of soldiering has become an industry in its own right. Mercenaries – of any nationality – are now known as “private contractors” or “defence contractors”. Governments are increasingly outsourcing the business of war. As with all outsourcing, the temporary hiring of military resources minimises the liability and cost that comes with the maintaining of permanent resources. Moreover it adds a layer of deniability when things go wrong and does not deprive the employer of any credit if things go well. The US has been using private contractors in a big way for some 4 decades now. After all, private contractor presence does not count as “boots on the ground”. The war in Iraq is now being conducted for the US to a large extent by private contractors. The U.S. government is preparing to boost the number of private contractors in Iraq as part of President Barack Obama’s growing effort to beat back Islamic State militants threatening the Baghdad government, a senior U.S. official said. How many contractors will deploy to Iraq – beyond the roughly 1,800 now working there for the U.S. State Department – will depend in part, the official said, on how widely dispersed U.S. troops advising Iraqi security forces are, and how far they are from U.S. diplomatic facilities. Still, the preparations to increase the number of contractors – who can be responsible for everything from security to vehicle repair and food service – underscores Obama’s growing commitment in Iraq. When U.S. troops and diplomats venture into war zones, contractors tend to follow, doing jobs once handled by the military itself. “It is certain that there will have to be some number of contractors brought in for additional support,” said the senior U.S. official, speaking on condition of anonymity. After Islamic State seized large swaths ofIraqi territory and the major city of Mosul in June, Obama ordered U.S. troops back to Iraq. Last month, he authorized roughly doubling the number of troops, who will be in non-combat roles, to 3,100, but is keen not to let the troop commitment grow too much. There are now about 1,750 U.S. troops in Iraq, and U.S. Defense Secretary Chuck Hagel last week ordered deployment of an additional 1,300. The U.S. military’s reliance on civilians was on display during Hagel’s trip to Baghdad this month, when he and his delegation were flown over the Iraqi capital in helicopters operated by State Department contractors. ……… the State Department boosted from 39 to 57 the number of personnel protecting the U.S. consulate in Erbil that came under threat from Islamic State forces during its June offensive. That team is provided by Triple Canopy, part of the Constellis Group conglomerate, which is the State Department’s largest security contractor. Constellis did not respond to a phone call seeking comment. The presence of contractors in Iraq, particularly private security firms, has been controversial since a series of violent incidents during the U.S. occupation, culminating in the September 2007 killing of 14 unarmed Iraqis by guards from Blackwater security firm. Three former guards were convicted in October of voluntary manslaughter charges and a fourth of murder in the case, which prompted reforms in U.S. government oversight of contractors. …….. The level of blanket spying by the US agencies (aided and abetted by so-called intelligence agencies of friendly countries), apparently on anyone and everything, as revealed by Edward Snowden, was amazing but not particularly shocking. It is not just enemies abroad who have been monitored. Even US citizens and organisations have been subject to eavesdropping, hacking, entrapment and plain theft. The NSA has even targeted the conversations of heads of friendly countries in their insatiable quest for information. The volume of information gathered and still being collected is truly staggering. All kinds of information is collected across every conceivable field. It covers law enforcement interests, foreign policy and industrial espionage. It ranges from financial matters related to tax evasion or money laundering, to the plans of terrorist groups, to the criminal activities of international gangs to industrial espionage of benefit to US corporations. Of course converting information into intelligence takes much analysis which requires the application of mind. Then converting intelligence into actions requires the will and the ability to act upon the intelligence. In spite of the huge amount of information that has been gathered, I have a clear perception that both the conversion of raw information into intelligence and the translation of intelligence into actions have been conspicuous by their absence. The events in Iraq over the last week are just one of a long line of instances where either the intelligence services have been caught napping or there is an extraordinary sequence of political failures to act upon available intelligence. Probably it is a combination of both. By the nature of spying, cases of successful intelligence analysis may never be known. But the number of apparent failures gives no confidence that the extensive spying is leading to any better intelligence. The massive gathering of information has certainly not managed to anticipate or prevent a very large number of unpleasant happenings – both domestically in the US and abroad. Of course some of the failures to act may well have been due to a lack of political action rather than a failure of intelligence. Barack Obama is so risk-averse that he generally overthinks every issue and then always chooses the “do nothing” option. In Iraq now, all that was ever supposedly gained during the war there is threatened and crumbling. Even so, in the face of this “urgent emergency” (is there any other kind?) he stated cautiously yesterday that all options were still on the table and that he is considering every option. But he may not actually order anything beyond a few drone strikes in support of Nouri al-Maliki. And once again – as in the case of Syria – he may find that the US has helped create a monster for the future. And he may find himself reluctantly allied with Iran. The possibility of coming to Iraq’s rescue raises a host of thorny questions for Mr. Obama, who has steadfastly resisted being drawn into sectarian strife in Iraq or its neighbor, Syria. Republican lawmakers accused him of being caught flat-footed by the crisis and of hastening this outcome by not leaving an adequate American force behind after 2011. Reports that Iran has sent its paramilitary Quds Force to help the struggling Iraqi Army battle the militant group, the Islamic State of Iraq and Syria, raised the awkward possibility that the United States could find itself allied with Iran in shoring up an unpopular Shiite government in Baghdad. The White House said it was aware of the reports, but did not confirm them. Mr. Obama insisted he had been monitoring the threat from Sunni militant groups for several months. The United States, he said, had supplied Iraq with military equipment and intelligence. The Washington Post writes that “despite years of training and billions of dollars in U.S. time and equipment, Iraq’s military is still a “checkpoint Army,” more interested in manning roadblocks than developing intelligence and engaging in counterinsurgency missions”. Saddam Hussain was no doubt one of the “bad guys”. But under his regime no mad jihadist leader or an ISIS army would have been allowed to establish itself, grow and then expand as Nouri al-Maliki’s government with US military support has permitted. Posted in Behaviour, Intelligence, Iraq, Politics, US | Comments Off on More spying, less intelligence? The Iraq war, where Tony Blair played poodle to George Bush, was prosecuted on a lie. They didn’t like Saddam Hussain and so they got rid of him. They sexed up their dossiers about Weapons of Mass Destruction. They sold the lie to the United Nations. They managed to establish the principle that any state may get involved in regime-change in any other state – whenever it has the desire and the might to do so. Their idiot-behaviour has led to the growth of subsequent terrorism and of large numbers of radicalised, Muslim, idiot-youth. The view history takes of Tony Blair will not be pretty. He will – I think – be seen as an opportunistic, money-grubbing, dishonest politician who took advantage of his former high position for obscene personal gain. The growth of radicalised Muslim youth in Europe with their juvenile antics in search of jihad are a direct consequence of the Iraq War and the War on Terror. But Tony Blair is getting worried about his legacy and his place in history and he is at it again. He would like the world to believe that radical Islam – which he helped to create – must be confronted in a new Crusade. Tony Blair’s speech seeking to rally global support for a confrontation with Islamic extremism generated a storm of reaction, most of it negative and much of it focusing on the messenger rather than the message. The director of the Council for Arab-British Understanding, Chris Doyle, said the former prime minister had been right to underline the importance of the subject in his Bloomberg speech but was sharply critical of the way he went about tackling it. Much of the commentary focused on Blair’s own credibility on the subject as much as the subject itself, particularly his role in leading Britain into the war in Iraq alongside the former US president George W Bush. Blair continues to be one of the most successful recruiters for radical Islam. Perhaps at the root of all of this is the suspicion that those who will welcome Blair’s speech most will be the radical Islamists right across the region and beyond. One aim of the 9/11 attacks was to incite a vigorous military response that that could be represented as a war not just against radical Islamists but against Islam itself. A “clash of civilisations” may be too strong a phrase for Blair’s speech but a clash of beliefs is not too strong a term to use, to which an Islamist response might well be – “bring it on”. The War on Terror is a crusade gone wrong. Certainly radical Islam is barbaric and uncivilised. But being barbaric and uncivilised against radical Islam, as Blair is and would like others to be, only legitimises and perpetuates the barbarism. Iraq has been followed by Afghanistan, by Libya, by Egypt and now by the fiasco in Syria. Much blood has been shed but all these irresponsible adventures have been spectacular failures in the War on Terror. Abu Ghraib and unmanned drones and State Terrorism and collateral damage have only legitimised the use of terror as a tactic of war. Boko Haram have learned the lesson. …. the Second Crusade, launched in 1145, is generally regarded as a disaster for the Christian West. Even those who took part in the Crusade saw it as a failure. According to William of Tyre: Thus a company of kings and princes such as we have not read of through all the ages had gathered and, for our sins, had been forced to return, covered with shame and disgrace, with their mission unfulfilled…. henceforth those who undertook the pilgrimages were fewer and less fervent. …. Brundage claims that the failure of the Crusade to achieve any victories whatever in the east emboldened Muslim military leaders, destroyed the myth of western prowess in arms, and was to be responsible, at least in part, for causing the Muslim states of the east to draw closer together, to unite for further attacks upon the Latin states. He says that the end of the Second Crusade saw the Muslims preparing to unite, for the first time, against the Latin intruders in their midst, while the Latins, for their part, were divided sharply against one another. Bernard was the Pope’s poodle as Blair was Bush’s. One of Bernard’s most influential acts, for better or worse, was his preaching of the Second Crusade. The First Crusade had given the Christian forces control of a few areas in Palestine, including the city of Edessa. When Moslem forces captured Edessa (37:08 N 38:46 E, now called Urfa and located in eastern Turkey) in 1144, King Louis VII of France (not to be confused with St. Louis IX, also a Crusader, but more than a century later) was eager to launch a crusade to retake Edessa and prevent a Moslem recapture of Jerusalem (31:47 N 35:13 E). He asked Bernard for help, and Bernard refused. He then asked the Pope to order Bernard to preach a Crusade. The pope gave the order, and Bernard preached, with spectacular results. Whole villages were emptied of able-bodied males as Bernard preached and his listeners vowed on the spot to head for Palestine and defend the Sacred Shrines with their lives. …. As for the Crusade, things went wrong from the start. The various rulers leading the movement were distrustful of one another and not disposed to work together. Of the soldiers who set out (contemporary estimates vary from 100,000 to 1,500,000), most died of disease and starvation before reaching their goal, and most of the remainder were killed or captured soon after their arrival. The impact on Bernard was devastating, and so was the impact on Europe. I don’t much care for Tony Blair. A family function led to some “scandalous” limericks being written about other family members (who were not present of course). It soon became obvious that putting together the rhymes – even with very free rhyming – and keeping the overall theme intact was not as easy as it seemed. Finishing a limerick is eminently satisfying and these are written entirely for myself with no particular audience in mind. Leading to ridicule for the iconic M’en’ess. And his poster policy became an object of mirth. He waged in Mali and now in CAR. And is now begging for a fund from capitalists. Once upon a time maps were dawn primarily as symbolic and pictorial descriptions of physical geography. Then came the nation states and “Nations of the Mind” became nations on the ground. With their dark under-belly of nationalism and jingoism, maps have become – nearly always – political, religious or ideological maps superimposed on and tied to physical geography. Some day humans will outgrow the limitations of nation-states and nationalism. “Nations” tied to a geography will eventually become obsolete but it will not be in my lifetime. The dynamics in the Middle East are particularly volatile and give rise to much speculation about how new nations could form and how the map of the region could develop. But much of the new formations – which are already ongoing – are not by design but by the realities on the ground. Many forces are engaged and much blood is being shed as the various parties try to impose their own designs. A few years ago Ralph Peters imagined a “better Middle East” in “Blood Borders: How a Better Middle East Would Look” and was heavily criticised for his provocative work. The map was prepared by Lieutenant-Colonel Ralph Peters. It was published in the Armed Forces Journal in June 2006, Peters is a retired colonel of the U.S. National War Academy. (Map Copyright Lieutenant-Colonel Ralph Peters 2006). The map is included in Peters’ book “Never Quit the Fight“. For all of Peters’s miscues, many of his core ideas are sound. His initial assertion – that misplaced boundaries often generate injustice and strife – is spot on. And he is right to point out that the foreign policy establishment refuses to acknowledge the violence engendered by geopolitical misalignment for fear of opening a Pandora’s Box of separatist demands. Because of that fear, any suggestions for alternative arrangements tend to be dismissed out of hand. Such a stance, Peters argues, is intellectually dishonest. New countries sometimes do appear on the map without ruffling the international order. Think of Montenegro, 2006. Such neophyte states must, however, come into being through the channels of global diplomacy if they want international recognition. Should they emerge on their own, their existence will be denied by the powers that be. In this way the system of international diplomacy that Peters mocks can indeed become a masquerade. Grant diplomatic recognition to Somaliland, the only effectively administered territory in the bedlam called Somalia? Impossibly destabilizing: surely anarchy would be loosed across the Horn of Africa! 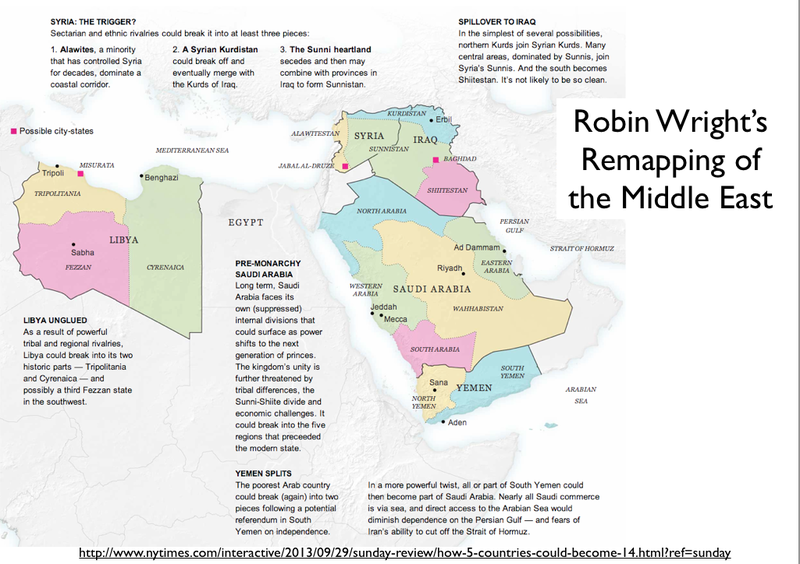 THE map of the modern Middle East, a political and economic pivot in the international order, is in tatters. Syria’s ruinous war is the turning point. But the centrifugal forces of rival beliefs, tribes and ethnicities — empowered by unintended consequences of the Arab Spring — are also pulling apart a region defined by European colonial powers a century ago and defended by Arab autocrats ever since. A different map would be a strategic game changer for just about everybody, potentially reconfiguring alliances, security challenges, trade and energy flows for much of the world, too. Syria’s prime location and muscle make it the strategic center of the Middle East. But it is a complex country, rich in religious and ethnic variety, and therefore fragile. After independence, Syria reeled from more than a half-dozen coups between 1949 and 1970, when the Assad dynasty seized full control. Now, after 30 months of bloodletting, diversity has turned deadly, killing both people and country. Syria has crumbled into three identifiable regions, each with its own flag and security forces. A different future is taking shape: a narrow statelet along a corridor from the south through Damascus, Homs and Hama to the northern Mediterranean coast controlled by the Assads’ minority Alawite sect. In the north, a small Kurdistan, largely autonomous since mid-2012. The biggest chunk is the Sunni-dominated heartland. 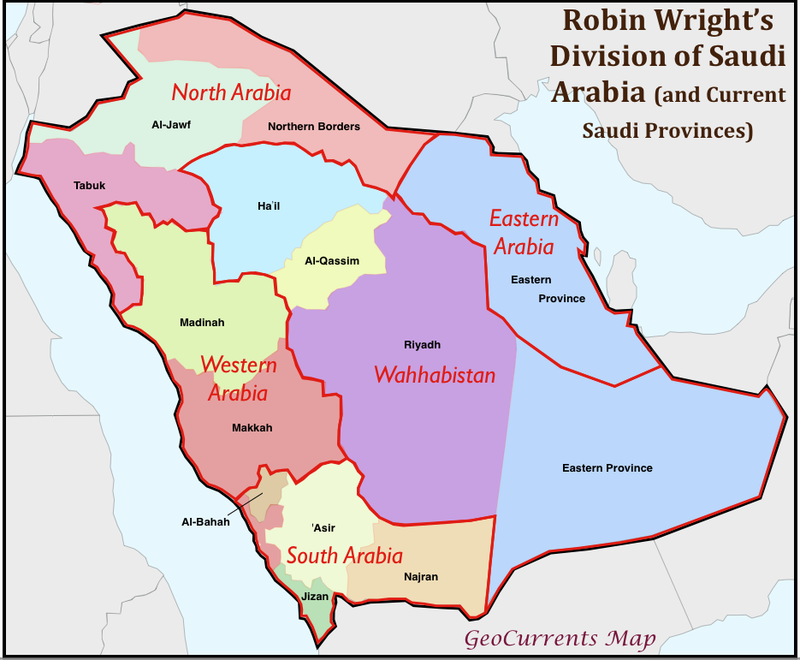 …….. My serious misgivings concern Wright’s treatment of Saudi Arabia. She realizes that she goes out on a limb here, noting that “The most fantastical ideas involve the Balkanization of Saudi Arabia…” Unlike the other countries that she remaps, Saudi Arabia is a relatively stable state, with no serious challenges to its territorial integrity. Imagining the division of this country thus does not involve speculating about the possible end-points of processes already in motion, as is the case in the other countries considered. It is not at all clear, moreover, why Wright has divided Saudi Arabia as she has, as her article is largely silent here. Presumably, her division is based on the idea that the non-Wahhabi peripheries of the country could detach themselves from the Wahhabi core, potentially resulting in the emergence of the new states of North Arabia, Eastern Arabia, South Arabia, and Western Arabia. Some kind of military action by the US and its allies – probably missile and drone attacks – is imminent against Syria and Assad. To what end is uncertain. To destroy stocks of chemical weapons could be an objective but any action would probably only cause more release of the toxins involved. To destroy or help destroy Assad’s regime is possible but unlikely since the alternative would probably be Al Qaida. To assassinate Assad runs the same risk. To kill some of Assad’s military or his supporters just as a “punitive” strike could be an objective but adding to the killing to stop the killing seems a little dubious. To demonstrate a self-righteous “moral” position to the world with the least damaging consequences possible would seem to the main objective. To prevent any future use of chemical weapons by any country could be an objective thought it is difficult to see how many “bad guys” would need to be killed or how much property would need to be destroyed to create a valid deterrent. For Iraq read Syria. For Bush, Blair, Chirac (my failing memory) and Howard read Obama, Cameron, Hollande and Rudd. Even though each of the current four leaders is from the opposing party to that of his predecessor. For WMD read “chemical or nerve gas”. Statements by the politicians show that they are absolutely “certain” that Assad was responsible. Evidence is not forthcoming. As it was not for Iraq. And it does not inspire any confidence that to justify the Iraq invasion, “evidence” was made-up by the intelligence services to satisfy their political masters. That upto some 300 people have been killed seems very likely though there is some doubt as to the number. The main evidence seems to be video footage. That some form of chemical or nerve agent was used seems probable. And traces of such agents are detectable years after the event, though some politicians (Obama and Kerry for example) would like us to believe that the evidence may be destroyed and therefore time is of the essence just to preserve the evidence. Though it is likely that someone within the Assad regime was probably responsible it is not at all impossible that one of the many “rebel” groups was responsible. Some of the rebel groups – along with Assad’s supporters – have exhibited their barbaric and cannibalistic tendencies. But I am afraid that military actions will be carried out – again – without any more serious objective than to demonstrate “moral superiority” and to fulfill domestic agendas. Even though such actions – in themselves – undermine the very moral superiority that is being touted. Some more people – some quite innocent – will of course be killed. They will just be collateral damage and the the sacrifice in a war of moral superiority. That Tony Blair on-board a luxurious yacht somewhere supports immediate strikes against Syria only adds to my feeling that it would be ill-advised. His thirst for blood is apparently not yet satisfied. Obama needs to show that he can actually be decisive – if only for history. Cameron needs a war – any war – before the next General Election and Spain over Gibraltar does not quite fit the bill. Argentina over the Falklands is better but too far away and already done. Hollande needs to show that he does really exist – as he did in Mali. Rudd would love to be seen at the “big table” and he could see this as a way for grabbing some of Abbot’s supporters for the election in less than 2 weeks. The chaos in Iraq and the daily loss of life that is occurring there is a direct consequence of the Iraq invasion (and how much worse would it have been under Saddam?). The adventure in Libya to satisfy the European desire for demonstrating their moral superiority will have consequences for many many years to come. Of course the Middle East today (like the Balkans a few years ago) provides proof positive of the barbarism that lies so close to the surface of many human “societies”. And the interventions by moral “police” has always dragged the police down to the level of the criminal societies they are ostensibly trying to put down. The intervention in Kosovo has succeeded after a fashion. But it is hard to come to to the same conclusion for Iraq or Afghanistan or Libya. To add Syria to the list seems irresponsible. The only way to address Syria – in my opinion – is to ostracise the entire country. Shun them. Close the borders. isolate them. No weapons – to anybody. No goods, no services to enter the country. Nobody and nothing enters. Only refugees may leave. Send the country to Coventry. Go back in a few months and when the killing stops – help the survivors pick up the pieces. But don’t intervene to add to the killing in the hope of stopping the killing. Cameron’s War: Syria + Sarin = Iraq + WMD? The war in Iraq is over. Everybody is pulling out of Afghanistan. That a state of violent chaos continues in these countries is really of no consequence. But the subsequent consumption of weapons and ammunition by the US and the UK and in Nato will be a little too low and a growth in this consumption is something to be desired. The Libyan escapade was far too short and too limited in scope to contribute much to the consumption of materials and to the coffers of the weapons industry. And a vigorous and profitable weapons industry does require that that consumption should grow and not just be maintained or – god forbid – be allowed to decline. The weapons industry needs a new war. After all if the existing weapons and ammunition don’t get used up how can one sell any more in these times of financial cut-backs. France has Mali. But the US and the UK desperately need a new war. The US needs a new war for economic reasons. Obama would like to leave office having won a war of his own. Bush’s war on terror is a little unsatisfactory since it can never be won and it is not something Obama has created himself. Getting Osama provided little profit for the weapons industry. Cameron needs a new war for purely domestic reasons. He will have to face a new election in 2015. He needs to recreate his own image – to try and live up to the heroic legacies of Winston Churchill in WW2, Margaret Thatcher in The Falklands and of Tony Blair in Iraq. Once upon a time, wars were declared when there was a genuine belief that no other options were available and a clear enemy could be defined. Bush and Blair (and Howard) and the neo-cons changed all that. They realised that the reasons for a desirable war could always be manufactured. Dossiers could be “sexed up” to invent enemies and provide evidence of their evil doings. Of course the “enemy” needed to be relatively weak so that a “victory” would not be jeopardised but sufficiently strong so that both air and ground forces could consume their equipment. Later if anybody found out that the reasons to go to war had been manufactured, they could just blame faulty intelligence. It could be happening again in Syria. Cameron really needs to reinvent himself and if it takes a war to do that – then so be it. To just follow in the footsteps of “Slimy Tony” is a little demeaning, so this time the evidence for Syria and Sarin gas will have to be manufactured much more carefully than for Iraq and WMD. BBC: The US president said there was “some evidence that chemical weapons have been used on the population in Syria, these are preliminary assessments, they’re based on our intelligence gathering. “We have varying degrees of confidence about the actual use, there’s a range of questions about how, when, where these weapons have been used,” he said. Mr Obama insisted more evidence was still needed and that there would be a “vigorous investigation”. But proof of their use would be a “game changer”, he said. “All of us, not just the United States, but around the world, have to recognise how we cannot stand by and permit the systematic use of weapons like chemical weapons on civilian populations,” he said. War has become just another tool of economic stimulus and for building the images of the war-leaders. When can “ends” no longer justify the “means”? At what level does “collateral damage” become unacceptable? And even after all the blood-letting in Iraq and Afghanistan there are still those who would like to see the US and Israel launch attacks on Iran. Iran dossiers are no doubt being “sexed-up” by those who are worried that not being at war with someone is not sustainable for business. A US soldier in Afghanistan has killed at least 16 civilians and wounded five after entering their homes in Kandahar province, senior local officials say. He left his military base in the early hours of the morning and opened fire in at least two homes; women and children were among the dead. Nato said it was investigating the “deeply regrettable incident”. The New York Times does cover this as its top story, but Fox News only reports – as its third story – that a US soldier has been detained for the alleged killing of civilians! It is Sunday and Huff Post and the Drudge Report – as of 1300 CET – have not even managed to report this “regrettable incident”. UPDATE! And now Reuters reports that it wasn’t one, lone, disturbed, “rogue” soldier but “a rampage that witnesses said was carried out by American soldiers who were laughing and appeared drunk”.